I thought I’d give a little update on the progress of the part I’m finding most difficult in this entire installation… The wiring. For most people that go to tackle installing a new headunit in their car on their own, I imagine that they’re reasonably familiar with wiring. For someone like myself that graduated with a degree after studying computer engineering, I should also be pretty familiar with wiring. But… I’m not. I went to university to get more of a hardware background as I was hoping that would be where my interests lay, but I ended up hating circuitry. I still do. Now that I actually have to apply some pretty basic circuitry knowledge to this install, I’m finding myself getting baffled by the most simple of things. Okay, so this isn’t all because I’m an idiot when it comes to circuits and wiring… I’ll take some of the blame, but this is actually a pretty tricky problem! Let me clarify right at the beginning of this section that this is NOT the wiring diagram I’m going with. There. 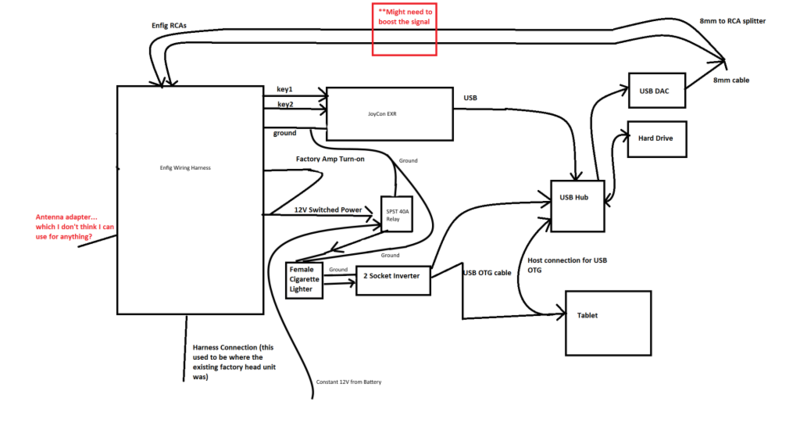 If you’re skimming over this stuff and you stop at this wiring diagram, I hope you realize that you shouldn’t use it. Okay, moving on. This was one of my first attempts at trying to figure out how to connect everything. I actually digitized it when I came across my first barrier that I should have realized right from the beginning, but I made a silly mistake. You’ll notice on the wiring diagram a big red X… That’s the mistake. Every guide I’ve read online for doing this type of head unit installation has suggested that you get dedicated power to the tablet and power your other components separately. This allows the tablet to draw as much juice as it needs to keep the battery at 100%. I made sure that I picked up two 12V to 5V step downs that had USB connectors on the end so that I could use one for the tablet and one for the USB hub. And that was the problem. I picked a USB hub that didn’t have external power but would allow power over USB. However, I needed to use that cable I planned to run power through to connect the hub to the tablet. If I put power into it, then the tablet would be a device on the hub instead of the host, and that’s exactly what I don’t need. I had to scrap part of this setup due to poor planning, but that’s part of the learning and the fun! So this is wiring attempt 2 and where I’m currently at. 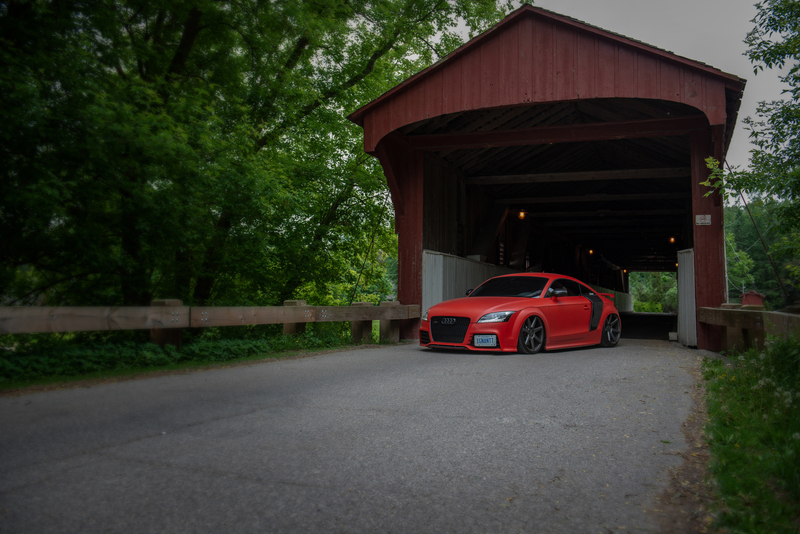 I spoke with friend Alex Post that’s been doing setups like this in cars for quite some time, and I still haven’t figured out why I didn’t speak with him sooner. 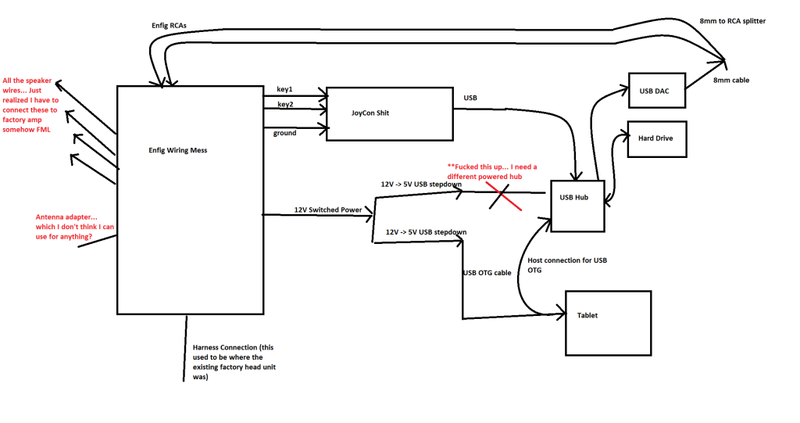 As you can see in the diagram above, I solved the USB hub issue by picking a hub that takes external power. This means that I can now connect it to the tablet and allow the tablet to be the host device while the hub is getting it’s own source of power. The relay segment of the wiring diagram allows me to use the 12V switched line to pull power directly from the battery. It’s not on the diagram, but I WILL need a fuse somewhere along that line. The relay then connects to the female cigarette lighter socket I purchased and then that will connect to an inverter that pumps out up to 300W. The cigarette lighter connector portion is a bit gnarly, but it makes everything simple for me to understand and work with. I spoke with my father over Christmas, and he was on board with the inverter approach. He also thought it was pretty dirty, but said it should work. Once I made it back from my parents’ place, he called me up to let me know that he wanted to try a different approach than using an inverter. I have a feeling it’s going to mean hacking up my power supplies for my devices, so I’m already a bit hesitant. I’ll update the web once I see what he has planned.